This 4 into 1 system features light-weight stainless steel construction and weighs under 12 lbs with the included baffle installed. It has stepped head pipes and a large 4-inch diameter megaphone. An O2 sensor bung is already welded in place. The system comes with mounting hardware. Only $819 & Free Freight! 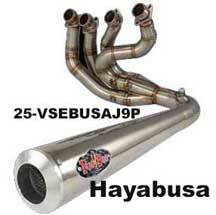 Hayabusa – GSXR1000 – ZX14 – Stainless Steel Construction! 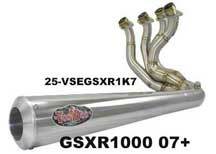 It has head pipes stepped from 1 ½” to a large 1 7/8” flowing into a 4 into 1 collector with a 4 inch diameter megaphone. An O2 sensor bung is already welded in place. The system comes with mounting hardware. 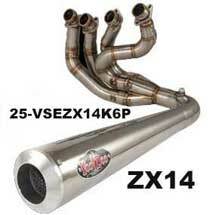 ZX14 systems include templates for the fairing modifications which are required for installation. Hayabusa systems also include billet block-offs for the removal of the oil cooler and templates for the fairing modifications both of which are required for installation. They are in stock for immediate shipment. Order by 2/28/2019 at 11:59 PM and mention DRAGBIKE.COM to get the special.